Hotels are so ubiquitous that it is easy to forget that they were once a novel concept, invented in the United States during the early nineteenth century. The first hotels were large, impressive structures that boasted private bedrooms, grand public ballrooms, and elegant architecture. By the late 1830s there were hundreds of them across the country. Historian Andrew Sandoval-Strausz argues that the hotel was, in essence, “the physical manifestation of a distinctly American vision of mobility, civil society, democracy, and space.”1 In other words, hotels were an expression of American culture—not only as a safe and comfortable place for travelers, but also as an integral part of everyday urban life. 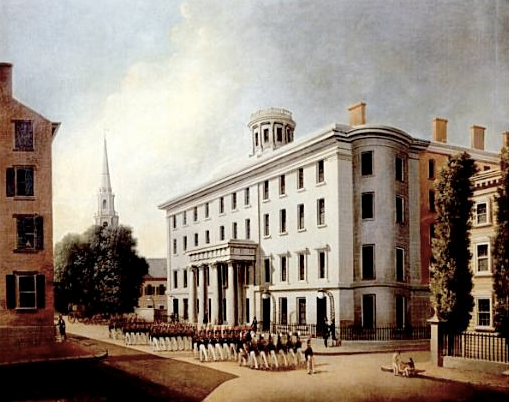 At a time when there were very few restaurants, luxury hotels like the Tremont house were routinely used for important dinners. 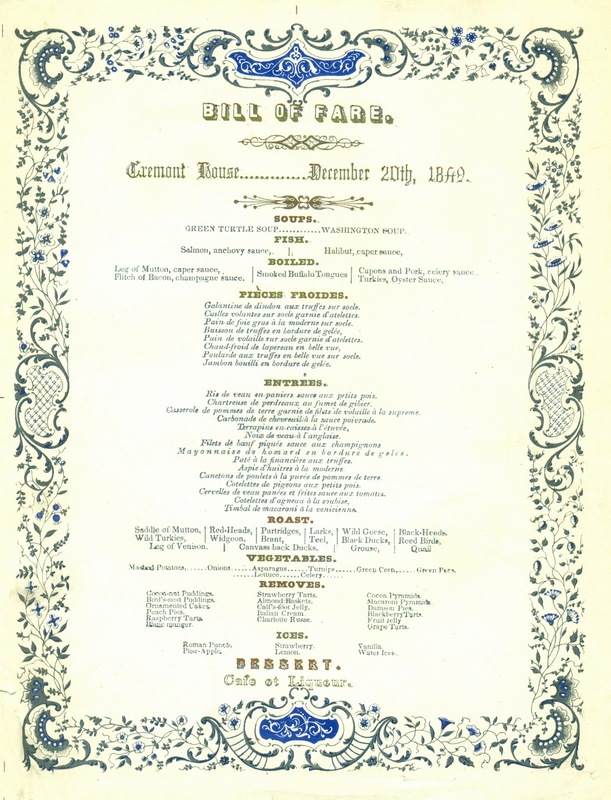 Four banquet menus from 1849-1851 show that the hotel maintained high culinary standards twenty years after it first opened. 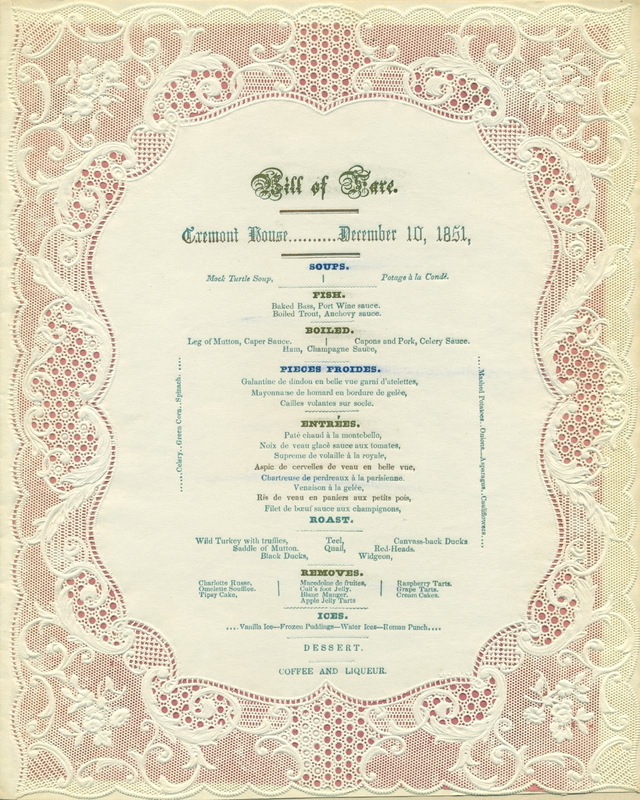 One of these special dinners marked the expansion of the railroads, an industrial development that went hand-in-hand with the growing number of hotels. 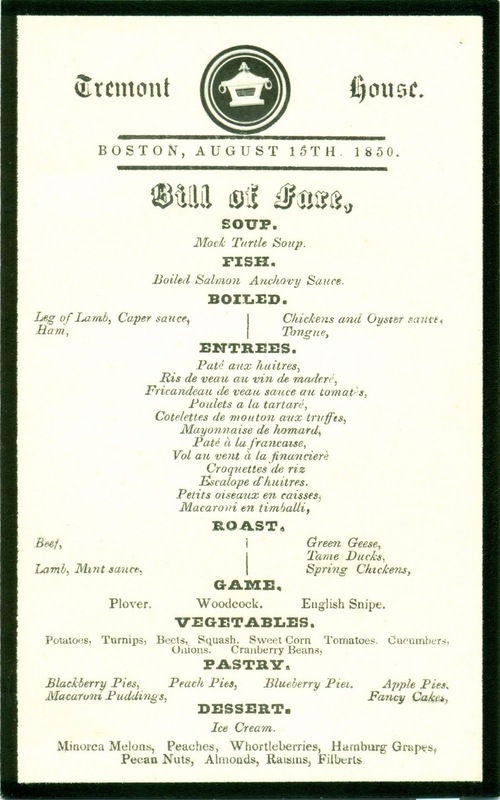 Although the cuisine at the Tremont House was predominantly French, many American foods appear on these menus, including some that have vanished—a poignant reminder of what we lost in the process of becoming a modern transient society. 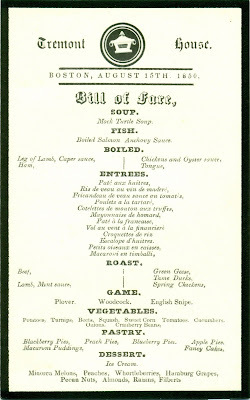 Dated August 15, 1850, the small menu card below is distinguished by a black funereal border, indicating the nature of this private event. Cranberry beans (also called “shell beans” in New England) make an appearance on this menu at a time of the season when the harvest of string beans would have been slowing down. 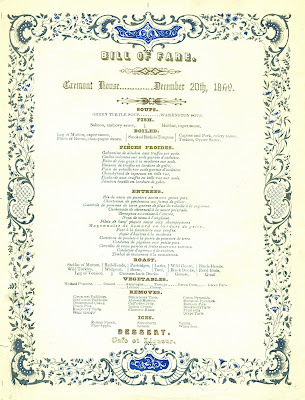 Two menus from 1851 are printed on lace paper of different designs. 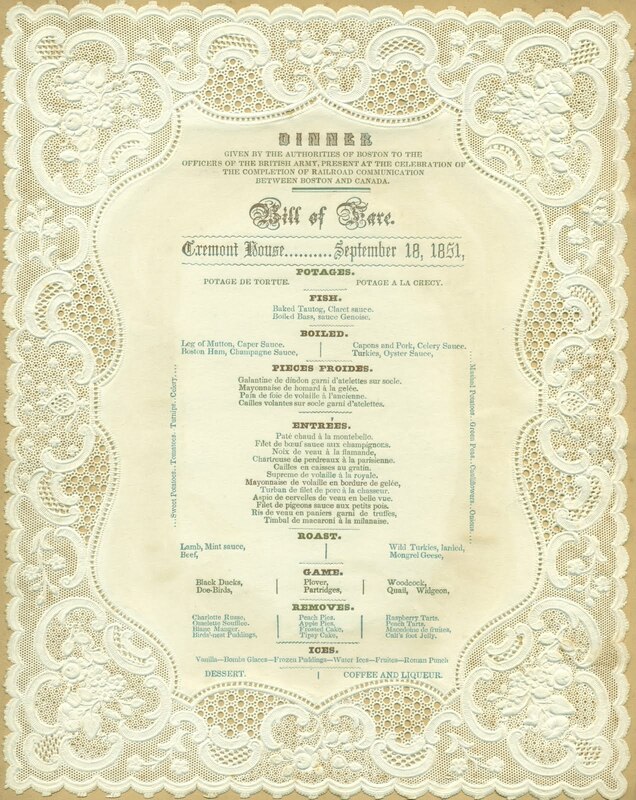 First developed around 1834, lace paper was still being imported from Britain.2 The first menu shown below, dated December 10, is mounted over a thin sheet of rose-colored paper, giving it the appearance of an early Valentine’s Day card. In the late 1840s, the holiday had been revitalized by the introduction of commercial cards. 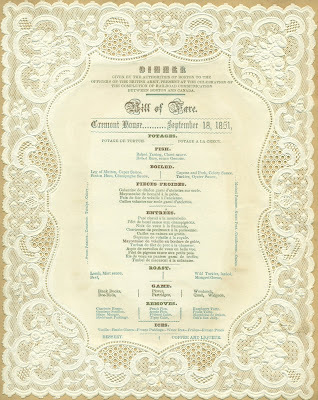 Three months earlier on September 18, 1851, a banquet was held for the officers of the British Army who were present at the completion of “railroad communication” between Boston and Canada. 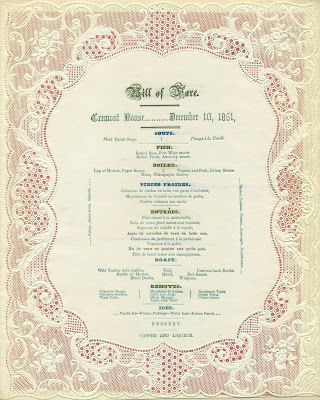 This act of hospitality was also a celebration of progress—one of the recurrent themes of such banquets during the nineteenth century. The types of fish and game on this menu reflect the late summer season, such as the baked tautog served with claret sauce. Still a popular inshore game fish in Massachusetts, the tautog is a blackfish whose distinctive name comes from the word tautauog in Narragansett, one of the extinct Algonquian languages. “Doe-birds” are listed among the game dishes. This delicacy was the Eskimo Curlew, a medium-sized shorebird with a long, bent beak. They arrived in large numbers on the uplands of Cape Cod during the end of August and early September each year. 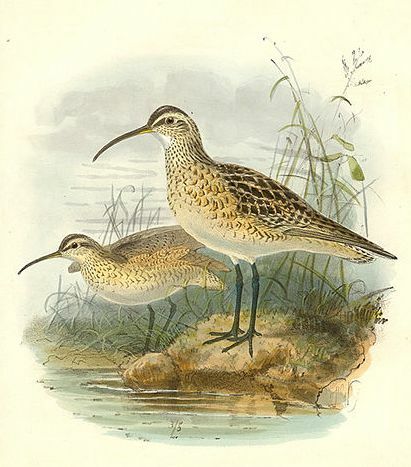 Known to be very fond of berries and grasshoppers, Eskimo Curlews were frequently seen in the company of the Golden Plover, a species that migrated at the same time and also can be found on this menu.3 Their long migratory routes extended 25,000 miles from the tundra in the Canadian High Arctic to the pampas of Argentina, returning in the spring through the Great Plains. In a sense, the plight of the “Doe Birds” began in early October 1492 when they were among the most numerous shorebirds in North America. A comparison of dates and migratory patterns suggests that Eskimo Curlews and Golden Plovers were probably the birds that Christopher Columbus first spotted after sixty-five days at sea. 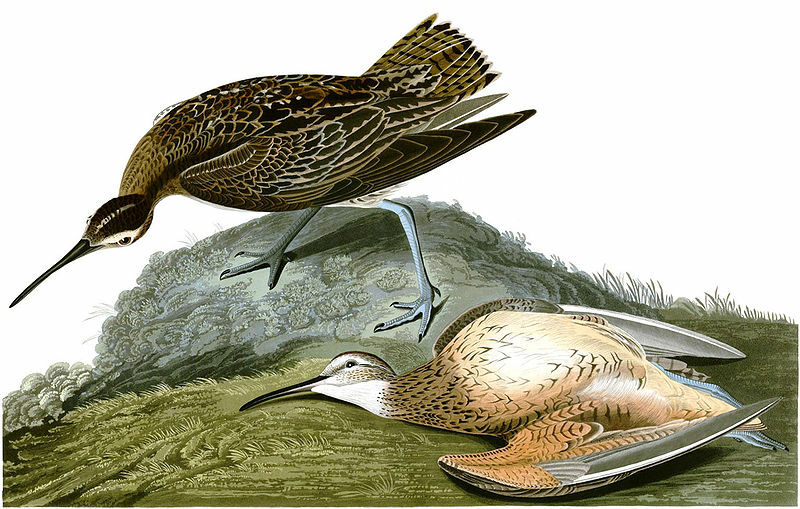 However, the real turning point for Eskimo Curlews came over 350 years later with rapid industrial growth and the societal changes that came with it. In the end, it was a combination of over-hunting and the loss of habitat—the mixed grass prairies that were home to the grasshoppers and other insects which were their primary spring food—that proved lethal to the species. Ironically, their demise was further hastened by celebrations of progress. 1. A. K. Sandoval-Strauz, Hotel: An American History, Yale University Press, 2007. 2. Maurice Rickards, Collecting Ephemera, London, 1988. 3. Gurdon Trumbull, Names and Portraits of Birds Which Interest Gunners with Descriptions in Languages Understanded (sic) of the People, Harper & Brothers, New York, 1888, p. 202-203. This is, as are all your posts, great and original. The variety of birds on 19th century menus is impressive. There is an interesting entry on "prairie hens" in the recent book on vanishing American delicacies, "Twain's Feast". Henry, I do enjoy the depth of your phrase, "Ironically, their demise was further hastened by celebrations of progress."